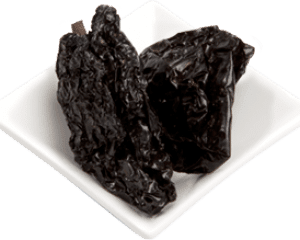 Chilli Ancho means “wide chilli” in Spanish and it is actually a dried Poblano pepper. They are a large dark purple sweet chilli that form the backbone of staple dishes such as tamales & red chilli beans. Its texture is wrinkled and it is a mild chilli originally from Puebla, Mexico. Also, it is a common and key ingredient in Mexican cuisine. It has a mild fruity flavour with undertones of plum, raisin, tobacco and a slight earthy bitterness. Add Chilli Ancho Dried Whole to your dishes to impart an authentic Mexican flavour. The whole dried pod can be ground in a blender (with or without the hot seeds, depending on heat preferences). You can also rehydrate them by pouring boiling-hot water over them and steeping for about 20 minutes. They can then be added to any stew, bean or rice dish. Try adding shredded ancho chilli flakes to you next pasta dish and appreciate the depth and richness it gives the sauce without the traditional chilli heat. Combine with Pasilla and Mulato Mexican chilli for preparing mole sauces. Used as a key ingredient in moles, tamales, enchiladas, salsa, soups and any sauce that may need a bit of extra heat. Add it to your recipes sliced or diced. All chillis including Chilli Ancho contain capsaicin which is known to have many health benefits including boosting the immune system, eliminating inflammation and helping with weight loss.